Even though I had no expectations at all when I started it. I had no idea what it was going to be about. I read it because it’s part of The Summer Reading Challenge at The Morning News. I didn’t even read the inside flap; just started reading. In his introduction Mr. Ball writes about his brother who had Downs syndrome. He writes about how once they grew up, the relationship began to look more like father/son than two brothers. What is in my heart when I consider him and his life is something so tremendous, so full of light, that I thought I must write a book that helps people see what it is like to know and love a Down syndrome boy or girl…I didn’t see exactly how it could be done, until I realized I would make a book that was hollow. I would place him in the middle of it, and write around him for the most part. He would be there in his effect. This did not lead me to expect a work of science fiction. But I’m not sure that Census really is a work of science fiction. Maybe I should read it as an allegory. Two days after finishing the book, I’m still not quite sure. It’s fair to ask if Mr. Ball pulled it off. Did he achieve the goal he laid out for himself in the introduction? Census is about a father and son. The father is a widower, a former surgeon who has become a census taker. His son has Down syndrome. The father is dying. He decides that he wants to spend his final days with his son, traveling across country taking one last census. Here we enter what might be considered the territory of science fiction. The world they travel through is not ours. It’s portrayed as decaying, not devastated, but no longer thriving. The towns the heroes travel through are all shells of what they once were. Things have closed down. People have moved away. They all seem to be in a form of stasis. As a census taker, he interviews the people he chooses to interview. No attempt is made to be thorough. He works as an independent agent, really just listening to what people have to say about their lives rather than asking a prescribed set of questions. When he is done, he makes a small tattoo on one of their ribs to mark them as having taken part in that decade’s census, so they will not be counted twice. Is that enough to make the book science fiction? There’s also a bit about a train ride back, which the boy will take once his father has died, that is described as roundabout and somewhat rambling, something that will take months to complete. Just what is Mr. Ball up to here? How is this in the service of his goal, portraying what is has been like to know and love someone with Down syndrome? Reading this book reminded me of both Cormac McCarthy’s The Road and Robert M. Pirsig’s Zen and the Art of Motorcycle Maintenance. Each feature father/son characters who are travelling across a strange countryside. One is a horrifying version of America’s future, the other America in the 1970’s. In each the father character is central, the boy is present sometimes, sometimes absent, at least from the narration. But, I think, in each we come to know the boy from his effect as Mr. Ball says. So do we come to know Down syndrome from its effect in Census? This is what I think. The narrator is able to approach a wide range of people while in the company of his son. Those he meets feel free to discuss all sorts of details about their personal lives though they have never met these two before. They tend to want to help, offer them lodging and food. Advice about where to go, whom to talk to. There’s an immediate closeness, a sense of safety. They are at ease. Is that what Mr. Ball means? It’s also true that the two never form a close relationship with anyone but each other. The rest of the world is just something they move through. The people they meet seem to like them, but they are not around for very long. They seem willing to help, but they never do so for more than a few days. Their connections appear deep, but they are not wide. Maybe he means both things at once or maybe I have not read Census they way he meant me to read it. I’m not sure that I have a better understanding of people with Down syndrome as a result of reading Census, but I did enjoy the ride. 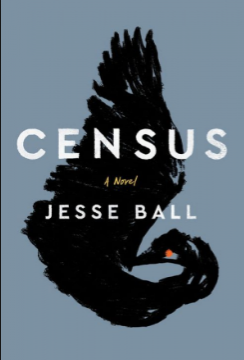 Census is an odd little book, a dark horse of sorts. But it’s one that I am glad I read. Having worked with children and adults with disabilities for so many years it almost sounds as though he is writing about the isolation parents often feel having a child with a disability. They come into contact with many people but never get to know them as they are busy with people in a professional capacity. Education, health. Their time constraints are many and they often are too busy dealing with daily challenges rather than having the luxury of too many long term relationships. I don’t know..just a thought. The characters in the book might symbolize this lifestyle. I can see that in Census. I’d love to hear what someone with more firsthand knowledge of the subject has do say about Census. How well does it get what the experience is like? It seemed to do a good job to me, though I’ve next to no knowledge myself.